Thousands of anti-government “yellow vest” demonstrators have rallied in the French capital as authorities sought to enforce a ban on protests in certain areas amid enhanced security measures to avoid a repeat of last week’s riots. Dozens of police vehicles, including armoured trucks and water cannon, encircled the Arc de Triomphe at the top of the iconic avenue, with officers searching people’s bags and patrolling in front of boarded-up storefronts. Paris police arrested 51 people by early afternoon, issued 29 fines and conducted 4,688 “preventive checks” on protesters entering the capital. “Those trying to scare people, or to scare themselves, are wrong,” he said in Belgium’s capital, Brussels. “Since when do soldiers face a population? We are here in France. You would say that we are here in [North] Korea or in China. I never saw something like this,” she said. Last week’s surge in violence came as support for the four-month-old “yellow vest” movement has been dwindling, mostly as a reaction to the riots by some protesters. 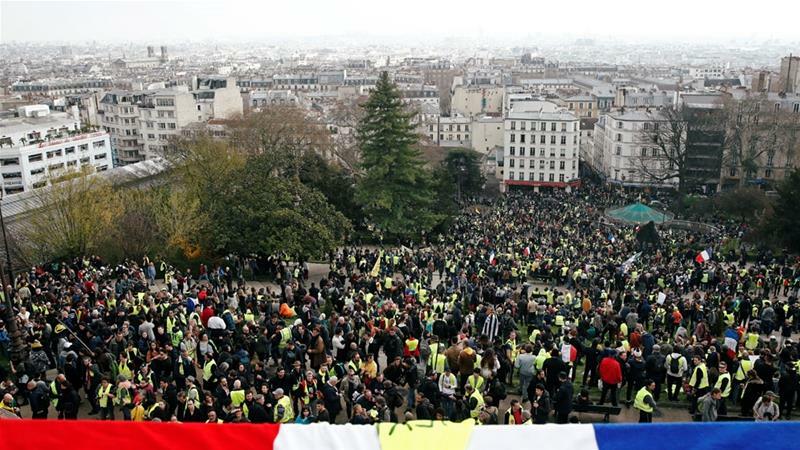 The rallies started in November to oppose a fuel tax raise but have expanded into a broader rejection of Macron’s economic policies, which protesters say favour businesses and the wealthy over ordinary French workers. Macron countered by dropping the fuel tax raise and holding months of discussions with the public on France’s stagnant wages, high taxes and high unemployment.